From the village, it can be reached within half an hour by walk. It has been built after the end of the pest in 1713/1714. 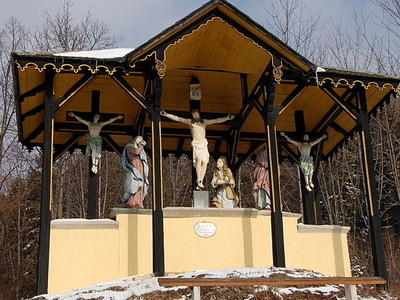 It is not the usual 14 stops of the way of the Cross, but chapels with realistic, nearly life-sized portrays of the secrets of the painful rosary. Among them is the "Holiday-maker´s chapel" (Jesus takes his leave from his mother) at the beginning, as well as the grave chapel at the of the Kalvarienberg. At Easter, processions and prayers take place here. Here's the our members favorite photos of "Churches near Gloggnitz". Upload your photo of Kalvarienberg!